Earthquakes have frequently hit Armenia throughout history. Soviet Armenia had three major quakes in the first fifty years of existence in Leninakan (1926) and Zangezur (1931 and 1968). 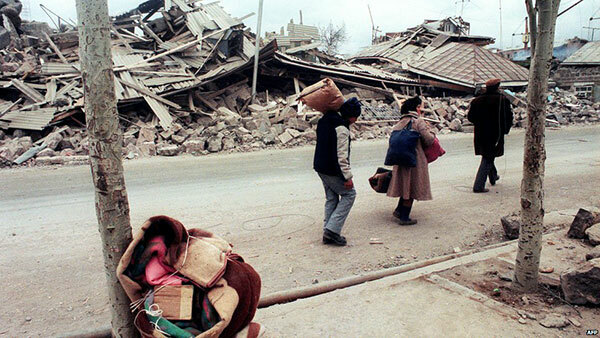 The fourth earthquake would be the worst, prompting a global effort for relief that remained unprecedented in the history of the former Soviet Union. 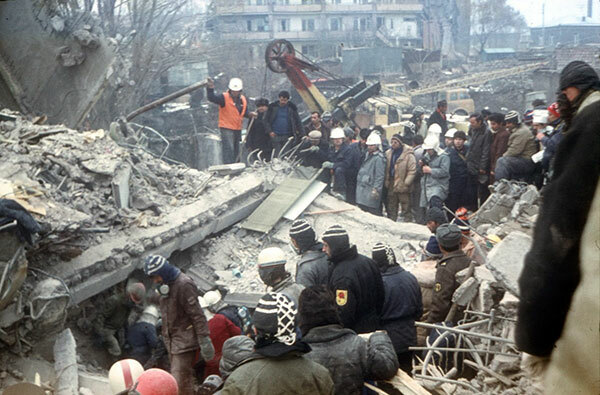 The seismic movement in the northern region of the Republic of Armenia occurred on Wednesday, December 7, 1988 at 11:41 am local time (2:41 am in the U.S. East Coast). The earthquake measured 6.8 on the surface wave magnitude scale. It was coincidental with the political turmoil that had been produced by the Karabagh movement since February 1988. In November of the same year, tens of thousands of Armenian refugees had arrived from Azerbaijan, and an unknown number of them had settled in the seismic area. The cities of Spitak, Leninakan (nowadays Gyumri), and Kirovakan (nowadays Vanadzor) were greatly affected with large loss of life and devastating effects to buildings and other structures. Smaller outlying villages away from the big cities were also severely affected. Leninakan and Kirovakan were the second and third cities of Armenia by population. Some of the strongest shaking occurred in industrial areas with chemical and food processing plants, electrical substations, and power plants. The nuclear power plant of Metzamor, 47 miles from the epicenter, did not experience damage, but vulnerability concerns triggered its shutdown from February 1989 until 1995. Many buildings did not hold up to the shaking of the earthquake and just came down like houses of cards. A saying in Leninakan at the time made reference to the resistance of old buildings from pre-Soviet time: “Leninakan went away, Gyumri remained.” The scrutiny by earthquake engineering experts found fault in the substandard quality of construction during the period of Leonid Brezhnev (1964-1982). Lack of effective medical care and poor planning also contributed to the substantial scope of the disaster. Most hospitals collapsed, killing two-thirds of the doctors, destroying equipment and medicine, and reducing the capacity to handle the critical medical needs in the region. Soviet leader Mikhail Gorbachev, who was in New York on his first day of official visits with President Ronald Reagan and Vice President George H. W. Bush at the time of the earthquake, formally asked the United States for humanitarian help within a few days of the earthquake, the first such request since World War II. One hundred and thirteen countries sent substantial amounts of humanitarian aid to the Soviet Union in the form of rescue equipment, search teams, and medical supplies, but private donations and assistance from non-governmental organizations also had a large part of the international effort. A group of French recording artists and actors came together with French Armenian writer and composer Charles Aznavour to record the 1989 song “Pour toi Arménie” (For you Armenia), with lyrics and music by Aznavour himself, as a call for help for the Armenians. Aznavour, together with his brother-in-law, French Armenian composer Georges Garvarentz, formed a foundation called “Aznavour for Armenia.” Almost two million copies of the disc were sold, which allowed the foundation to build 47 schools and three orphanages for the victims of the disaster. As of July 1989 about $500 million in donations had been delivered to the Armenians from 113 countries. Most of those funds went into the initial relief work and medical care plus the beginning portion of the rebuilding phase. Yuri S. Mkhitarian, an Armenian State Building Committee official, gave an updated damage report that stated that 342 villages had been damaged and another 58 destroyed. One hundred and thirty factories had been destroyed and 170,000 people were out of work. Officials acknowledged that the work to complete the rebuilding may take up to five years or longer, a supposition that more than doubled Gorbachev's estimate of two years. The number of victims of the earthquake was officially given as 25,000, even though there were estimates of up to 100,000. The material and moral impact of the earthquake was long-term. 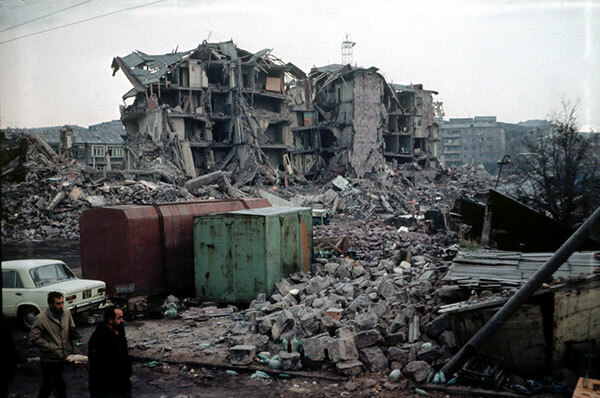 The collapse of the Soviet Union and the second independence of Armenia (1991), including the economic crisis and the Kharabagh war, became a hurdle to complete the efforts of reconstruction. Rebuilding in major cities and villages was completed after years, and still there were people living in makeshift homes twenty-five years after the earthquake.